This year’s record hurricane season has led to the biggest spike in government disaster contracts in more than a decade, testing the government’s ability to manage the unpredictable and growing costs of climate change. 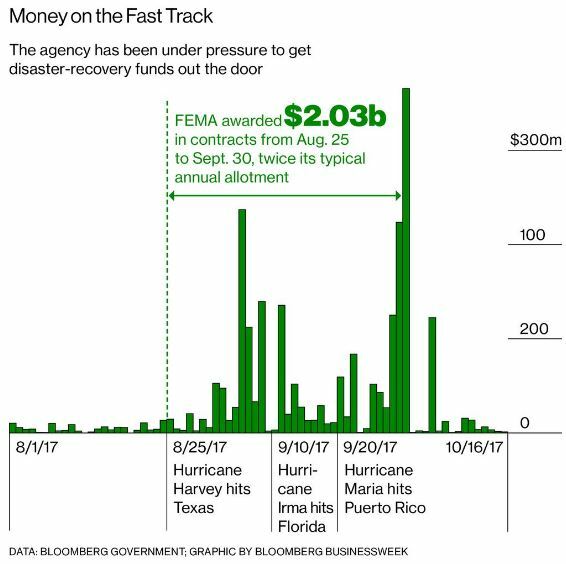 Since Hurricane Harvey struck Texas on Aug. 25, the Federal Emergency Management Agency has awarded $2.2 billion in contracts, according to data compiled by Bloomberg Government. That’s about twice what the agency typically awards over an entire year. The Small Business Administration (SBA) has identified officials responsible for the agency’s contracting in support of emergency recovery efforts in the wake of Hurricanes Harvey and Irma. The information available here lists SBA points of contact (POCs) for disaster contracts nationwide, 8(a) program waivers nationwide, protests and eligibility matters, and regional contacts. The SBA is reiterating the importance of the government’s Disaster Response Registry for firms wishing to be identified by government contracting officials as potential contractors in activity categories such as debris removal, distribution of supplies, reconstruction, and other disaster or emergency relief supplies and/or services. Government agencies search the Disaster Response Registry of the System for Award Management (SAM) to find contractors that can help respond to disasters. The Registry within SAM lists contractors that offer services that support disaster recovery contracting efforts. Local firms affected by a Presidential major disaster or emergency declaration may be given contracting preferences under the terms of the Stafford Act. Businesses must register in SAM to be eligible for disaster relief contracting opportunities. On average, it takes 2-3 days to complete the registration process. Once your registration is active, your firm will be added to the Disaster Response Registry. During registration, you must indicate you want to participate in the Disaster Response Registry and provide the required information on the Disaster Response Information page within the Assertions module. Contact the Federal Service Desk (FSD) to get help registering. If you’re located in the U.S. and its outlying areas, you can get free support from your local Procurement Technical Assistance Center (PTAC), an official resource for government contracting assistance. In Georgia, the PTAC is operated by Georgia Tech. 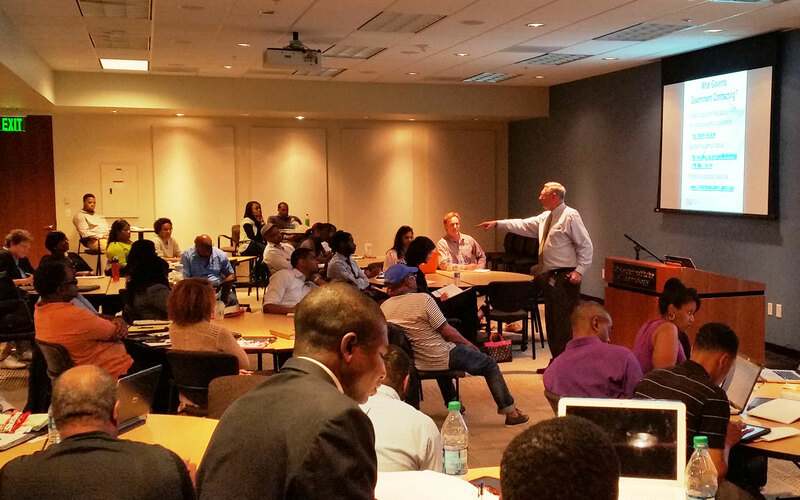 The Georgia Tech Procurement Assistance Center (GTPAC) advises businesses to seek its no-cost assistance before paying for any registration services. GTPAC also warns vendors to be cautious in selecting outside help, noting a recent fraud conviction involving a company misrepresenting itself as a vendor registration list for FEMA. Remember, it is FREE to register and maintain your registration in SAM. If you get an email from any address that does not end in .gov or .mil, be cautious. If you get an email, text message, or phone call asking for money or payment of any amount, be very cautious. These parties do not represent the U.S. government. You engage third party vendors at your own risk. In Georgia, you can contact a PTAC counselor at the Georgia Tech Procurement Assistance Center at: http://gtpac.org/team-directory. If your business is located outside Georgia, you can identify the PTAC serving your state at: http://www.aptac-us.org/find-a-ptac. If you are seeking to do business with the Federal Emergency Management Agency (FEMA) in support of a disaster recovery effort, please be aware that in accordance with the Robert T. Stafford Act, FEMA seeks out local companies to perform contract work within the disaster area for goods and services related to a specific disaster. The Army Corps of Engineers, and its contractors, actually do a lot of disaster response and recovery work such as debris removal. Use this link to access more information on contracting with the Corps in emergency situations: http://www.usace.army.mil/Missions/Emergency-Operations/Contracting-in-Disasters. You can use this link — www.moveit.gsa.gov — for access to the General Services Administration (GSA) Transportation Management Services Solution (TMSS). FEMA procures many of its transportation needs through GSA including: truckload services, air charter, barges, air freight, air ambulance, heavy hauler, rail, vehicle rental, truck rental, travel trailers, and mobile homes. Please Note: There are companies that mimic services of Federal agencies, and these companies typically charge fees for services that your business can typically accomplish yourself. Be aware that most, if not all, Federal Government services are free of charge. If you are approached by letter, email or phone to buy access to federal contracting opportunities, always make it a practice to reach out to the appropriate Federal agency first to inquire about the validity of the service, specifically if a fee is associated with it. An excellent source of no-cost assistance associated with navigating the government contracting process is the Georgia Tech Procurement Assistance Center (GTPAC). You may contact GTPAC via email at: gtpacatl@innovate.gatech.edu. 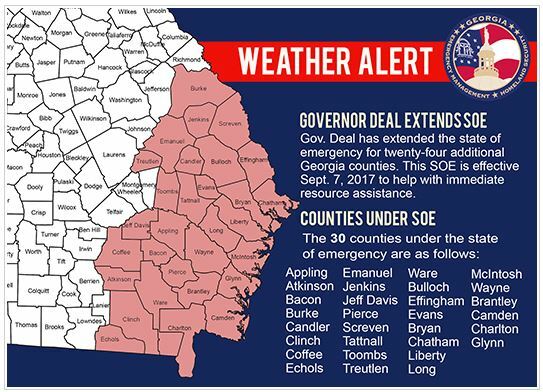 If your business is located outside the state of Georgia, you can find similar no- or low-cost help at: http://www.aptac-us.org/find-a-ptac. Get to know the Federal Business Opportunities website www.fbo.gov (known as FedBizOpps or FBO). FedBizOpps is the single point-of-entry to search, monitor, and retrieve Federal procurement opportunities. You will also find subcontractor, supplier and teaming opportunities here. Monitor the Department of Homeland Security’s planned contract opportunities on the DHS Acquisition Planning Forecast System (APFS) located at: http://apfs.dhs.gov/. Promote your business in electronic catalogs. If you are a GSA Schedule contractor, GSA Advantage and other electronic commerce initiatives will allow you to list your products or services for government browsing. Publish your catalog listings on your company website. Having a website allows interested buyers to access additional information regarding your company (experience, past performance record, financial stability) after reviewing product descriptions. See other helpful information at: http://gtpac.org/2017/08/31/register-free-if-you-want-to-provide-debris-removal-supplies-reconstruction-and-other-disaster-or-emergency-relief. The work-in-progress known as government transparency took a new twist on April 1 when the Treasury Department unveiled “improvements” to the USAspending.gov website aimed at providing easy public access to data on federal contracts, grants and financial assistance governmentwide. David Lebryk, Treasury’s fiscal assistant secretary, in a blog post described the change — done in response to external feedback– as improving “navigation to allow users to more directly summarize spending data” and to take advantage of a platform borrowed from the award-winning Recovery.gov website used to track spending on the 2009 stimulus legislation. The refreshed website is supposed to be easier to navigate and understand (it uses plain language instead of government jargon); provide interactive mapping of prime recipients’ localities and enhanced agency and state financial data summaries; connect subcontract award data to prime awards; and expand search capabilities for simplified titles. Filing claims against the government is not contractors’ preferred method of resolving problems on a federal project, but often contractors are left with little choice with federal procurement officials spread thin. For example, the U.S. Army Corps of Engineers has not moved on a significant number of pending changes and refused to pay the contract balance because the Corps has assessed an equal amount in liquidated damages for delay. The delay was caused by a differing site condition, for which the contractor submitted a claim for time and money. After waiting 60 days, the Corps responded by stating that it will issue the contracting officer’s final decision in seven months. Meanwhile, the contractor continues to spend money trying to close out the project. How can contractors speed up the claims process, recover on favorable terms, and avoid throwing good money after bad on a multiyear dispute resolution process? The answer: Unbundle your claims and file as many under $50,000 or $100,000 as possible to take advantage of the various board of contract appeals’ expedited or accelerated procedures. Then consolidate all expedited appeals and push aggressively toward a fast and cost-effective global resolution. Minnesota has failed for three years to meet federal requirements for a program designed to steer millions of dollars in state transportation projects to minority- and women-owned businesses. The program has been so plagued by mismanagement and weak oversight that some firms were awarded multimillion dollar contracts for which they might not have otherwise qualified. In one case, nearly $1.6 million for buying materials on the Union Depot project in St. Paul was funneled through a minority- or women-owned firm to a non-minority-owned contractor. In another case on the same project, nearly $2 million was improperly credited to a non-minority-owned firm. The findings and others, included in an internal audit of the Disadvantaged Business Enterprise (DBE) program, have led to a shake-up in the Minnesota Department of Transportation’s Office of Civil Rights and may result in additional investigations. “This is absolutely a wake-up call,” said state Sen. Scott Dibble, DFL-Minneapolis, chairman of the Transportation and Public Safety Committee. Given the gravity of the issues raised by MnDOT’s internal audit, Dibble said he may ask the Legislative Auditor’s Office to conduct its own independent review. Transportation department officials said they are moving quickly to address the shortcomings cited in the audit of the DBE program. The 30-year-old DBE program has long been plagued with fraud and oversight problems at both the federal and state levels. In 2010 and 2011 alone, U.S. Department of Transportation fraud investigations led to $88 million in recoveries, restitutions and fines, along with 10 federal indictments and eight criminal convictions. President Obama proposed a new set of programs and plans to stimulate the economy — but there aren’t enough federal employees to oversee the money and programs from the previous stimulus. American Public Media’s Marketplace reporter John Dimsdale takes a look at the hold up. Kai Ryssdal: The White House is studiously not calling its latest economic package a new stimulus plan. Might be just as well: Getting money from earlier federal programs out into the economy has run into a bottleneck. There aren’t enough federal workers to award and manage all those government contracts. Our Washington bureau chief John Dimsdale reports. John Dimsdale: The problem, says Allison Stanger, the author of “One Nation Under Contract,” is the number of federal employees today is the same as it was in 1963. Allison Stanger: Yet the federal budget in real terms in that the same period of time has more than tripled. And that enormous gap is filled by contractors. The government was short of people to oversee contracts from nuclear waste disposal to the space program, even before the wars in Iraq and Afghanistan, which rely heavily on contractors. Now, add another $275 billion in stimulus contracts and monitoring all of them for waste and fraud is almost impossible, says Don Kettl, dean of the school of public policy at the University of Maryland. Don Kettl: We’ve so vastly increased the amount of spending in such a short time, government employees are really struggling to keep up with the oversight burdens that have come along with the recovery program. In some cases, government agencies have had to contract out oversight of their own contracts. Richard Skinner: Matter of fact, we’ve experienced that here in DHS. Richard Skinner, the inspector general at the Department of Homeland Security, says that’s fraught with potential conflicts of interest. Skinner: These contractors may not have the government’s best interest in play here. I do not believe it’s healthy to have contractors managing other contractors. Skinner says the government needs more skilled managers. And in fact, President Obama wants to boost the government’s contract work force by 5 percent. Author Alison Stanger has another suggestion. She means let the public track all governments contracts right on the Internet. In Washington, I’m John Dimsdale for Marketplace. Small businesses won a record $96.8 billion in federal prime contracts in Fiscal Year (FY) 2009 (Oct. 1, 2008-Sept. 30, 2009), an increase of more than $3 billion from FY 2008, according to the U.S. Small Business Administration’s fourth annual small business procurement scorecard released today. This dollar amount represents 21.89 percent of all federal spending – an improvement over FY2008. Additionally, performance in each of the government’s socioeconomic subcategories increased for FY2009. SBA is required to report to the President and Congress on achievements by federal agencies and departments against their annual goal to ensure greater accountability. The small business Procurement Scorecard fulfills that requirement by providing an assessment of federal achievement in prime contracting and subcontracting to small businesses by the 24 Chief Financial Officers Act agencies. It also measures progress that departments are making to ensure small business opportunities remain an integral part of their acquisition of goods and services to meet mission objectives. The fourth annual Scorecard is an assessment tool (1) to measure how well federal agencies reach their small business and socio-economic prime contracting and subcontracting goals, (2) provide accurate and transparent contracting data and (3) report agency-specific progress. The prime and subcontracting component goals include goals for small businesses, small businesses owned by women, small disadvantaged businesses, service-disabled veteran owned small businesses, and small businesses in located in HUBZones. As it does every year, the SBA has closely examined federal procurement reporting and data to ensure the greatest level of transparency possible. After identifying anomalies in initial reports, the SBA has worked collaboratively – and will continue to work – with agencies across the government to correct as many data issues as possible, and improve the integrity of all small business federal contracting reporting moving forward. The American Recovery and Reinvestment Act (ARRA) provided additional resources to federal agencies in fiscal year 2009, providing additional opportunities for small businesses to win federal contracts. Through early August, small businesses have secured over 30 percent of Recovery Act Contracts. This preliminary data underscores the priority the Administration and the SBA have placed on increasing small businesses access to federal contracts so that they can grow and create jobs. SBA graded 24 agencies on each of the individual prime contracting goals established by Congress and used a new A+ through F letter grade system rather than the previous red, yellow, and green ratings. The new scorecard format was implemented this year to provide greater clarity and transparency on how well each agency is doing in meeting its individual small business prime contracting goals. Each federal agency has a different small business contracting goal, determined annually in consultation with SBA. SBA ensures that the sum total of all of the goals meets the 23 percent target established by law. Each agency’s overall grade will show an A+ for agencies that meet or exceed 120 percent of their goals, an A for those between 100 percent and 119 percent, a B for 90 to 99 percent, a C for 80 to 89 percent, a D for 70 to 79 percent and an F for less than 70 percent. An agency’s overall grade was comprised of three quantitative measures: prime contracts (80 percent), subcontracts (10 percent) and its progress plan for meeting goals (10 percent). The scorecards released Aug. 27, 2010 by SBA, as well as a detailed explanation of the new scorecard methodology, is available online: http://www.sba.gov/aboutsba/sbaprograms/goals/index.html. As part of its ongoing efforts to increase access to contracting opportunities for small businesses, the SBA is continuing to work with federal agency procurement staff to strengthen the integrity of contracting data, including providing tools to facilitate public review of data, improvements to systems and training to improve accuracy. In February 2009, the United States had fallen into what many economists called the deepest economic slowdown since the Great Depression. The housing bubble had burst, unemployment was nearing its highest level in almost three decades and the once-freewheeling banking sector had turned tightfisted. At the urging of President Obama, Congress passed a $787 billion economic stimulus bill on Feb. 10, 2009, to get federal dollars flowing into the U.S. economy. Eighteen months later, the administration estimates that about 85 percent of the jobs it expected to create or save in the first two years have indeed been created or saved. The economy is rebounding slowly, and the worst effects of the recession have softened. Unemployment, while still high, is better than it otherwise would have been. For the most part, mainstream economists such as those at the Congressional Budget Office agree with those conclusions. But an examination by McClatchy Newspapers and the Medill News Service has found that some parts of the country have benefited far more from the American Recovery and Reinvestment Act than others, that some sectors of the economy are benefiting far more than others, and that it’s difficult to detail exactly where all the money has gone. • The jobless rates in the states had little to do with where major portions of the stimulus package were distributed. Some states with the lowest unemployment rates received some of the highest per-capita spending for stimulus projects. • Job creation on the local level has been uneven. By the White House’s numbers, for example, Nebraska created 74 percent of the expected jobs, while North Dakota and Massachusetts created 100 percent. • The Obama administration won’t be able to fulfill its vow to track every stimulus dollar. The mechanism that’s used to account for the expenditures is complicated, flawed and at times inaccurate. • Much of the stimulus money has yet to go out the door. As of July, $127 billion in contracts, grants and loans had been awarded, but that’s less than half the $275 billion allocated for those projects. That’s partly by design and partly because it was difficult to get systems in place to spend money quickly for the array of new programs that the stimulus bill funded. The White House projected creating or saving about 3.5 million jobs in the first two years after the stimulus bill passed. In a July report, the administration estimated that it’s created or saved about 3 million of them, about 85 percent of the expected total. While they agree that the stimulus package has created jobs, other economists are less optimistic than the White House is. The CBO says the job boost could be as low as 1.4 million or as high as 3.4 million. Three other economic organizations – all of which the White House cited in its July report – put the jobs tally at 1.8 million, 2.1 million or 2.2 million. It’s clear from the McClatchy-Medill analysis of stimulus spending and unemployment, however, that some states have fared much better than others have. North Dakota has had one of the nation’s lowest unemployment rates for the past year. In June, it hit 3.6 percent. Yet the analysis found that it’s scheduled to receive more stimulus spending, per capita, than is Nevada, where the unemployment rate climbed to 14.2 percent in June. Veronique de Rugy of George Mason University testified before the House Committee on Transportation and Infrastructure in March that she and other researchers could not find any relationship between unemployment in a given area and the amount of stimulus dollars spent there. “No matter how we measure unemployment, we find no correlation,” she said. Though other economists recognize de Rugy’s findings, some disagree with her and Glaeser that funding stimulus programs without regard for local unemployment or economic conditions is a problem. Administration officials also disagree that targeting communities with high jobless rates would have been a better approach. Obama also pushed the stimulus bill with a promise that the American people would be able to account for “every penny” that was spent. However, a year and a half later – despite spending $18 million to launch an unprecedented system for tracking stimulus bill spending – much of the reported funding information doesn’t match the dollars the federal government says it’s paid. Although the administration reports how much each government agency has spent, that’s only half the story. When stimulus dollars are spent, they’re funneled through states, agencies and contractors to the “sub-recipients” that build roads, do research or retrain unemployed workers. After they receive the money, states and recipients are supposed to record how they spend it and report those totals to the federal government. That’s where things get confusing. The $280 billion set aside for the states came fast and without clear accounting procedures. Moreover, the federal government didn’t include any money for states to hire the people necessary to track the deluge of money.